Some of you may have heard of my trouble with having my textures taken and used without permission by AnneJoy Paine (aDiva). Since I originally found out, aDiva's old stores were closed by mall owners and landowners. A few days ago, it has come to my knowledge that aDiva has opened at least 6 new stores. She is of course free to open stores, as long as she doesn't sell items that use textures taken and copied from my work. Unfortunately, after having checked all the locations I know about, I found out that AnneJoy Paine (aDiva) is still selling items using copies of my textures in her vendors in the new stores. I have filed a DMCA notification on these new locations with linden labs on Oct 28, 2007 and I am now awaiting their response. Pictures listed below have been recently taken from the vendors in the new stores. On the left I have included pictures of my originals. 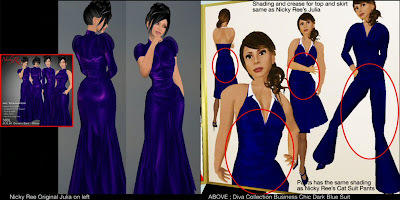 When I originally found out about this issue, I contacted AnneJoy Paine immediately and asked her to stop using my textures and stop selling those items based on them. She denied any wrong-doing. A few days later, I sent her a cease and desist notice giving her 72 hours to respond. She did not. Since then I have started the DMCA notification procedure with Linden Lab. I do not know if these DMCA notifications will stop AnneJoy Paine from continuing doing what she has with my work. Linden Lab has not taken action yet. This is the second batch of stores I have found out about that is still selling the items listed in the pictures. She might open more stores in the future. I do not know what else I can do. Responding to all this has taken a lot of time already, and a lot of frustration. I suggest that all who read this take heed and do not purchase anything from this store. Takee heed all buyers of fine clothes. It taakes alot of fine time and for one to infringe is outrageous. yes i agree, the photo comparisons are quite striking, and she has modified so that its not obvious, but how did she get your textures? You all take your dress models from the internet fashion sites. And each of you use a different texture. What copiyng? From the internet? yes I agree to the last comment...as if Nicky Ree didnt use inspiration from other designers or real life fashion sites and clothing. Its just shading and highlighting. 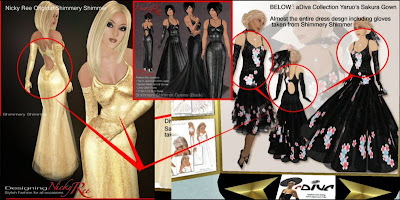 How do you know she didnt just look at your dress and use it as an example, maybe she strives to be like you Nicky Ree. I have often examined other designers clothes to see how they do things. Its how I learned. Take it as a compliment. I seriously dont think she used the actual texture. It´s to funny! OK, next time someone says, "my color is blue, it´s MINE!". Running around and shout "Ahhh, XY has stolen my color!" I didn´t know before, the Mrs. Ree is the "Goddess of Shadows and Design"
It´s only funny, but a good promotion... cheap and easy. Anonymous said before:" ... as if Nicky Ree didn´t use inspiration..."
NEVER!! SHE is the Inspiration for the rest of the World! come on, this is only some shading similar to yours. she didn't use your texture! it looks like Nicky's jelaous... sorry but that's what comes to my mind after reading your story. Sorry Anonymous, but I was Annejoy Paine's manageress ... in fact I was the person that first took her seriously and gave her a shop. During my time working with her she mentioned several times of her tools to rip textures etc from other peoples items ... and these tools have been demonstatrated to my by scripters who have worked with many top names to stop those in SL like Annejoy Paine who steal content. I even have a friend who wanted a Nonna Hedges top not as a jacket but as a shirt layer .. Annejoy volunteered immedatley to do this and the IDENTICAL Nonna Hedges top came back .. except .. it had Annejoy Paine's name on it as creator. This top is STILL in existence I can assure you - physical proof of Annejoys texture ripping and design fraud. When I became aware of this fraud, I separated ways with Annejoy and at that time she changed her brand name DIVA to what it is now called .. ADIVA. I am sorry - I was there at the beginning .. and even at the beginning she was copying ... I refuse to work with such people. There are many admirable scripters and other individuals working for the good of content designers in SL .. dedicating time to stopping these thieves. I applaud these individuals, just as I applaud the people blessed with the energy to use there own imaginations to create ... not those who take the easy option to steal and then claim credit for designs that are not theres. so.. what about if you compare both works now. I see here bloggings from two years ago..i would be very curious how its looking now. Found this by accident. I dont know if Ms. Paine rips other designers. A few days ago i found a very early design of AP in my inventory. It was so bad. Her progresses in designing were unbeleavable. And she publishes many designs every week. The rate is amazing. And i know, how many time a good design take. So think what you want. But another thing. I was a member of her group but i left. It was more than i could bear. AP was moaning about everthing: Ppl weren't friendly enough to her or her models. She published many groupnotices with this content. She always wanted humility when she gave a freebie. And her groupmembers gave her what she wanted: ty Anne, you are so great Anne, i never bought another design after knowing your shop Anne and so on. I think, if she makes a fart, her group members will become crazy of appreciation. So i left this group. Some strange thing happened to me too with this lady. I was banned from her shop some times ago. And until now i dont know why. So i began to google for the ladys name, i found this. Wow, she really has a bad reputation. What she doesnt know that i m an alt, my main avi bought alot at her shop. But never more. Will never set a foot in this shop again. And btw. look to her dresses: after i found out these things here i was more sensible about her "designs". Throw a sharp look on her casuals, there are many surprises. Do You love the Skin You're in? Who is that gorgeous av? What was on offer this halloween?